The History of Nigerian Football Clubs With Huge Scorelines - Haba Naija! The Nigerian League now known as the Nigerian National League, over the years have been known to be a difficult league to play in, getting away wins is usually difficult no matter how strong you are, then taking about scoring goals is another difficulty, it was only recently during the 2010/2011 season that the record of 20 league goals in a season was set by Jude Aneke currently playing for Kaduna United, the previous record was held by Ahmed Musa who is currently with CSKA Moscow in Russia, he scored 18 goals for Kano pillars during the 2009/2010 season. Before Ahmed Musa’s record the all time leading goal scorer in the league was Ishaya Jatau with 17 goals in 1990. These records go to show how scarce goals are in the league, so when we hear a huge score line in games, it usually makes the headlines. But notwithstanding, some clubs in a desperate bid to avoid relegation or gain promotion into the next division, do not care what people think and they go ahead to fix matches to get the required results. The first huge score line in the Nigerian League came in 2007 when on the last day of the league, Akwa United who needed to score 13 goals to gain promotion into the Nigerian Premier League, thrashed neighbours Calabar Rovers 13-0, and during the cause of the season, Akwa united had scored only 12 goals in 14 matches, there were investigations but no sanction on Akwa United. Then in 2009 Zamfara United hammered Kaduna United 9 – 0 to secure their premier league status this led to an investigation and the funny part is, this score line meant they finished above Akwa United on goal difference, Akwa united got relegated that year. Just as Nigerians were gradually forgetting about all of these, we woke up to the news that in an attempt to gain promotion into the Nigerian Division 2 league, Four Division 3 teams had been involved in a goal scoring galore! First up, Plateau United defeated Akurba FC 79 – 0, a game that was 7 – 0 at half time, which means 72 goals were scored in the second half of only 45 minutes that’s an average of 1 goal in every 37.5seconds in the second half and 1.1 goals per minute for the whole 90minutes, which is just stunning. As if that was not enough, Police Machine FC. defeated Babayaro FC 67 – 0 to also gain promotion, a game that was just 6 – 0 at half time witnessed 61 goals in the second half, that’s a goal was scored in every 44.2 seconds in the second half and in the cause of 90minutes a goal was scored in every 1.3minutes. Did you just say amazing? that word may just be too modest for these teams. And to think Nigerians claim the National team lack quality finishers, and the coach should look got clinical strikers, well i just think the search is over with the attack these two teams parade. These four teams have brought shame to our league, the news is on every major newspaper and channel in the world, the NFF have begun investigations, FIFA may step in, while the owner of Babayaro FC disbanded his team immediately he heard the scoreline. As long as nothing is done to these teams, there may be more crazy score lines on the horizon in the League. 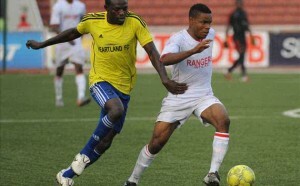 The Nigerian Premier League: Why are we still behind?